Ecological resistance in the twenty-first century has more and more been informed by the development of Marxian ecology and ecosocialism more generally. However, as ecosocialist analysis has grown, various divergent branches of thought have emerged, often in conflict with each other. Based on the conviction that clarity about capitalism’s relation to the environment is indispensable for the strategic understanding of present-day struggles, this talk will present some of the new research within Marxian ecology, bringing together the core issues of the expropriation of nature and the metabolic rift, and seeking to unite the ecosocialist movements of our time. 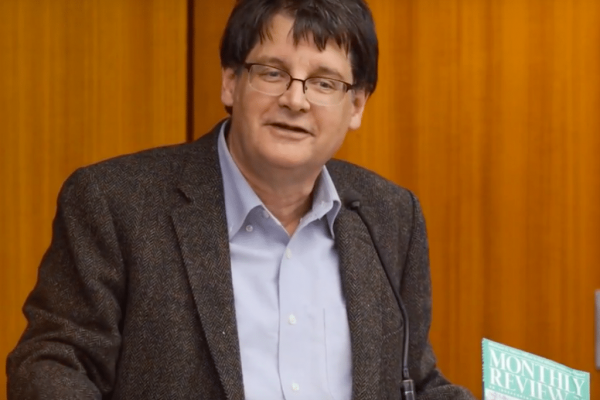 John Bellamy Foster, professor of sociology at the University of Oregon, is editor of Monthly Review, an independent socialist magazine published monthly in New York City. His research is devoted to critical inquiries into theory and history, focusing primarily on the economic, political and ecological contradictions of capitalism, but also encompassing the wider realm of social theory as a whole. He has published numerous articles and books focusing on the political economy of capitalism and the economic crisis, ecology and the ecological crisis, and Marxist theory: (with Paul Burkett) Marx and the Earth: An Anti-Critique (2016); The Theory of Monopoly Capitalism: An Elaboration of Marxian Political Economy (New Edition, 2014); (with Robert W. McChesney) The Endless Crisis: How Monopoly-Finance Capital Produces Stagnation and Upheaval from the USA to China (2012); (with Fred Magdoff) What Every Environmentalist Needs to Know About Capitalism: A Citizen's Guide to Capitalism and the Environment (2011); (with Brett Clark and Richard York) The Ecological Rift: Capitalism’s War on the Earth (2009); (with Fred Magdoff) The Great Financial Crisis: Causes and Consequences (2009); The Ecological Revolution: Making Peace with the Planet (2009); (with Brett Clark and Richard York) Critique of Intelligent Design: Materialism versus Creationism from Antiquity to the Present (2008); Ecology Against Capitalism (2002); Marx's Ecology: Materialism and Nature (2000); (with Frederick H. Buttel and Fred Magdoff) Hungry for Profit: The Agribusiness Threat to Farmers, Food, and the Environment (2000); The Vulnerable Planet: A Short Economic History of the Environment (1999); (with Ellen Meiksins Wood and Robert W. McChesney) Capitalism and the Information Age: The Political Economy of the Global Communication Revolution (1998); (with Ellen Meiksins Wood) In Defense of History: Marxism and the Postmodern Agenda (1997); The Theory of Monopoly Capitalism: An Elaboration of Marxian Political Economy (1986); (with Henryk Szlajfer) The Faltering Economy: The Problem of Accumulation Under Monopoly Capitalism (1984). His work is published in at least twenty-five languages. Visit johnbellamyfoster.org for a collection of most of Foster's works currently available online.